Members of the Class of 2107 will be invited to join the credentials archiving service offered by Parchment, Inc. 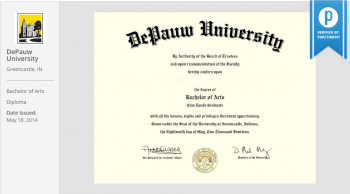 The credentials service is free and during this first pilot year DePauw graduates will have a certified electronic copy of their diploma posted to their archive. 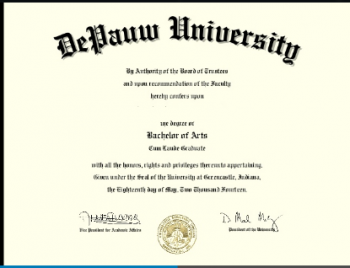 DePauw is one of the pilot schools testing the new certified eDiploma offered by Parchment, Inc. Members of the Class of 2017 will receive in their DePauw email an invitation to set up a credentials archive with Parchment and in that archive will be a certified copy of their DePauw diploma. 1. When you download a copy of your diploma from the credentials archive. the first page of the file is a copy of your diploma. 2. The second page is a certification page. If further verification is required, the recipient is given two ways to obtain it. 3. This is the LinkedIn version which goes in the certifications section of your site. You can also download a copy of your eDiploma and post it in the Education section. This also works with Facebook. Is this safe? The diploma itself doesn't contain any information that you're probably not already posting. Someone viewing your diploma on LinkedIn could make a copy of the image but copies of diplomas are rarely accepted as identification or verification of degree. Will this be recognized as official? This is a new service so there won't be instant recognition. But credentials of all types are rapidly entering the digital world. Over half of the transcripts that DePauw issues are electronic and many services, like AMCAS and LSAC, that used to not accept electronic transcripts are moving toward that being the preferred if not the required format. We think the same will happen with diplomas and other credentials. Is an eDiploma useful? The traditional paper diploma with the University seal is largely a ceremonial document--something to put in a frame and hang on your wall. The eDiploma will have a number of uses that the paper doesn't have. Currently, companies pay $5 to verify a degree. If you include a copy of your eDiploma with your resume the prospective employer can easily verify that it is official without having to go to a service. Similarly, you can carry a copy of your diploma on your phone and use it if you're ever asked to verify your academic credentials. Why is it free? DePauw is one of 12 schools in the U.S. selected to try this service out. This was largely because a high percentage of the transcripts we issue are electronic. Parchment gave us a really good price on the diplomas, which we were able to cover with our transcript revenue. But this will probably be the last time this is free, so be sure to get it while you can.